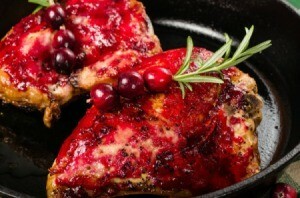 This guide contains black raspberry glazed chicken recipes. These simple recipes are easy to make but are perfect for a fancy meal. The sweet tanginess of the raspberry preserves and whole raspberries is the perfect pairing for chicken. 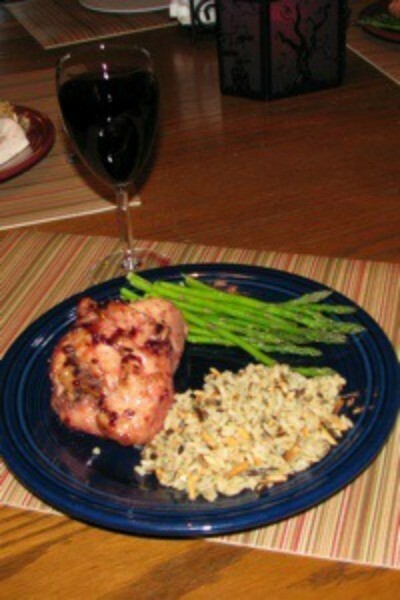 This is a wonderful simple yet fancy recipe that is perfect for entertaining. I made it for a Valentine's dinner for my boyfriend back in High School and it's now my husband's favorite. 2 pkgs. Uncle Ben's Herb Seasoned Wild and Long Grain Rice. Cook Uncle Ben's Wild Rice mix according to package directions, substituting chicken broth for the water. It will take about 30 minutes. Spread slivered almonds on cookie sheet and place in oven to toast. Place about a cup of rice in a bowl and mix with about 2 tablespoons of the slivered almonds. Put the rest of the wild rice mix aside. Place flour, paprika, garlic powder, and salt in a gallon size ziplock bag. Place chicken breasts in bag, 2 at a time, shake, then pound flat (I use a rolling pin). Place about 2 tablespoons of stuffing in the center of each chicken breast and roll up. Secure with a toothpick. Place in 9/13 inch baking pan and top with melted butter. Mix jam, honey, orange juice concentrate, and orange peel in saucepan and heat until blended to make glaze. Baste chicken with glaze and continue baking and glazing until chicken is tender and highly glazed about 30 minutes - basting about every 10 minutes. I often substitute unstrained homemade blackberry jam for the seedless black raspberry jam and use Johnny's Seasoning rather than paprika, salt, and garlic powder. I often measure the honey and jam for the glaze in a glass measuring cup (using the side measures) then heat in microwave to save on dishes. You can leave out the orange peel if you don't have an orange handy. Combine all into crock pot, mix (except chicken and raspberries). Heat on high 10 minutes, mix again. Add chicken, coating well. Cook on low 7 hours. Leave raspberries so room temperature. Serve over chicken in plates.